Long, long ago, there was an assembly of great sages on the bank of the river Sarasvati, and they performed a great sacrifice of the name Satrayajna. In such assemblies, the great sages present usually discuss Vedic subject matters and philosophical topics, and in this particular meeting the following question was raised: The three predominating deities of this material world, namely, Lord Brahma, Lord Visnu and Lord Siva, are directing all the affairs of this cosmos, but who among them is the Supreme? After much discussion on this question, the great sage named Bhrgu, who is the son of Lord Brahma, was deputed to test all three predominating deities and report to the assembly as to who is the greatest. Being thus deputed, the great sage Bhrgu Muni first of all went to his father's residence in Brahmaloka. The three deities are the controllers of the three material qualities, namely the qualities of goodness, passion and ignorance. The plan decided upon by the sages was for Bhrgu to test which of the predominating deities possesses the quality of goodness in full. Therefore, when Bhrgu Muni reached his father, Lord Brahma, because he wanted to test whether he had the quality of goodness, he purposely did not offer his respects to his father either by offering obeisances or by offering prayers. It is the duty of a son or a disciple to offer respects and recite suitable prayers when he approaches his father or spiritual master. But Bhrgu Muni purposely failed to offer respects, just to see Lord Brahma's reaction to this negligence. Lord Brahma was very angry at his son's impudency, and he showed signs which definitely proved this to be so. He was even prepared to condemn Bhrgu by cursing him, but because Bhrgu was his son, Lord Brahma controlled his anger with his great intelligence. This means that although the quality of passion was prominent in Lord Brahma, he had the power to control it. Lord Brahma's anger and his controlling his anger are likened to fire and water. Water is produced from fire, but fire can be extinguished with water. Similarly, although Lord Brahma was very angry due to his quality of passion, he could still control his passion because Bhrgu Muni was his son. After testing Lord Brahma, Bhrgu Muni went directly to the planet Kailasa, where Lord Siva resides. Bhrgu Muni happened to be Lord Siva's brother. Therefore, as soon as Bhrgu Muni approached, Lord Siva was very glad and personally rose to embrace him. But when Lord Siva approached, Bhrgu Muni refused to embrace him. "My dear brother," he said, "you are always very impure. Because you smear your body with ashes, you are not very clean. Please do not touch me." When Bhrgu Muni refused to embrace his brother, saying that Lord Siva was very impure, the latter became very angry with him. It is said that an offense can be committed either with the body, with the mind or by speech. Bhrgu Muni's first offense, committed towards Lord Brahma, was an offense with the mind. His second offense, committed towards Lord Siva by insulting him, criticizing him for unclean habits, was an offense by speech. Because the quality of ignorance is prominent in Lord Siva, when he heard Bhrgu's insult, his eyes immediately became red with anger. With uncontrollable rage, he took up his trident and prepared to kill Bhrgu Muni. At that time, Lord Siva's wife, Parvati, was present. Her personality is a mixture of the three qualities, and therefore she is called Trigunamayi. In this case, she saved the situation by evoking Lord Siva's quality of goodness. She fell down at the feet of her husband, and with her sweet words she talked him out of killing Bhrgu Muni. After being saved from the anger of Lord Siva, Bhrgu Muni went directly to the planet Svetadvipa, where Lord Visnu was lying on a bed of flowers, accompanied by His wife, the goddess of fortune, who was engaged in massaging His lotus feet. There Bhrgu Muni purposely committed the greatest sin by offending Lord Visnu by his bodily activities. The first offense committed by Bhrgu Muni was mental, the second offense was vocal, and the third offense was corporal. These different offenses are progressively greater in degree. An offense committed within the mind is a positive offense, the same offense, committed verbally is comparatively more grave, and when committed by bodily action it is superlative in offensiveness. So Bhrgu Muni committed the greatest offense by touching the chest of the Lord with his foot in the presence of the goddess of fortune. Of course, Lord Visnu is all-merciful. He did not become angry at the activities of Bhrgu Muni because Bhrgu Muni was a great brahmana. A brahmana is to be excused even if he sometimes commits an offense, and Lord Visnu set the example. Yet it is said that from the time of this incident, the goddess of fortune, Laksmi, has not been very favorably disposed towards the brahmanas, and therefore, because the goddess of fortune withholds her benedictions from them, the brahmanas are generally very poor. Bhrgu Muni's touching the chest of Lord Visnu with his foot was certainly a great offense, but Lord Visnu is so great that He did not care. The so-called brahmanas of the Kali-yuga are sometimes very proud that they can touch the chest of Lord Visnu with their feet. But when Bhrgu Muni touched the chest of Lord Visnu with his feet, it was different because although it was the greatest offense, Lord Visnu, being greatly magnanimous, did not take it very seriously. Instead of being angry or cursing Bhrgu Muni, Lord Visnu immediately got up from His bed along with His wife, the goddess of fortune, and offered respectful obeisances to the brahmana. He addressed Bhrgu Muni as follows: "My dear brahmana, it is a great blessing for Me that you have come here. Please, therefore, sit down on this cushion for a few minutes. My dear brahmana, I am very sorry that when you first entered I could not receive you properly. It was a great offense on My part, and I beg you to pardon Me. You are so pure and great that the water which washes your feet can purify even the places of pilgrimage. Therefore, I request you to purify the Vaikuntha planet where I live with My associates. My dear father, O great sage, I know that your feet are very soft, like a lotus flower, and that My chest is as hard as a thunderbolt. I am therefore afraid that you may have felt some pain by touching My chest with your feet. Let Me therefore touch your feet to relieve the pain you have suffered." Lord Visnu then began to massage the feet of Bhrgu Muni. The Lord continued to address Bhrgu Muni. "My dear lord," He said, "My chest has now become sanctified because of the touch of your feet, and I am now assured that the goddess of fortune, Laksmi, will be very glad to live there perpetually." Another name for Laksmi is Cancala. She does not stay in one place for a long time. Therefore, we see that a rich man's family sometimes becomes poor after a few generations, and sometimes we see that a poor man's family becomes very rich. Laksmi, the goddess of fortune, is Cancala in this material world, whereas in the Vaikuntha planets she eternally lives at the lotus feet of the Lord. Because Laksmi is famous as Cancala, Lord Narayana indicated that she might not have been living perpetually by His chest, but because His chest had been touched by the feet of Bhrgu Muni, it was now sanctified, and there was no chance that the goddess of fortune would leave. Bhrgu Muni, however, could understand his position and that of the Lord, and he was struck with wonder at the behavior of the Supreme Personality of Godhead. Because of his gratitude, his voice choked up, and he was unable to reply to the words of the Lord. Tears glided from his eyes, and he could not say anything. He simply stood silently before the Lord. After testing Lord Brahma, Lord Siva and Lord Visnu, Bhrgu Muni returned to the assembly of great sages on the bank of the river Sarasvati and described his experience. After hearing him with great attention, the sages concluded that of all the predominating deities, certainly Visnu is situated in the mode of goodness in the highest degree. In the Srimad-Bhagavatam, these great sages are described as brahma-vadinam. Brahma-vadinam means those who talk about the Absolute Truth but have not yet come to a conclusion. Generally brahma-vadi refers to the impersonalists or to those who are students of the Vedas. It is to be understood, therefore, that all the gathered sages were serious students of Vedic literature, but had not come to definite conclusions as to who is the Supreme Absolute Personality of Godhead. After hearing of Bhrgu Muni's experience in meeting all three predominating deities, Lord Siva, Lord Brahma, and Lord Visnu, the sages concluded that Lord Visnu is the Supreme Truth, the Personality of Godhead. It is said in the Srimad-Bhagavatam that after hearing the details from Bhrgu Muni, the sages were astonished because although Lord Brahma and Lord Siva were immediately agitated, Lord Visnu, in spite of being kicked by Bhrgu Muni, was not agitated in the least. The example is given that small lamps may become agitated by th breeze, but the greatest lamp or the greatest illuminating source, the sun, is never moved, even by the greatest hurricane. One's greatness has to be estimated by one's ability to tolerate provoking situations. The sages gathered on the bank of the river Sarasvati concluded that if anyone wants actual peace and freedom from all fearfulness, he should take shelter of the lotus feet of Visnu. If Lord Brahma and Lord Siva lost their peaceful attitude upon a slight provocation, how could they maintain the peace and tranquillity of their devotees? As for Lord Visnu, however, it is stated in the Bhagavad-gita that anyone who accepts Lord Visnu or Krsna as the supreme friend attains the highest perfection of peaceful life. The sages thus concluded that by following the principles of vaisnava-dharma, one becomes actually perfect. But if one follows all the religious principles of a particular sect and does not become advanced in understanding the Supreme Personality of Godhead, Visnu, all such labor of love is fruitless. To execute religious principles means to come to the platform of perfect knowledge. If one comes to the platform of perfect knowledge, then he will be disinterested in material affairs. Perfect knowledge means to know one's own self and to know the Supreme Self. The Supreme Self and the individual self, although one in quality, are different in quantity. This analytical understanding of knowledge is perfect. Simply to understand, "I am not matter; I am spirit," is not perfect knowledge. The real religious principle is devotional service, or bhakti. This is confirmed in the Bhagavad-gita. Lord Krsna says, "Give up all other religious principles and simply surrender unto Me." Therefore, the term dharma applies only to the vaisnava-dharma or bhagavad-dharma, following which all other good qualities and advancements in life are automatically achieved. The highest perfectional knowledge is to know the Supreme Lord. He cannot be understood by any process of religion other than devotional service; therefore, the immediate result of perfect knowledge is achieved by executing devotional service. After attainment of knowledge, one becomes disinterested in the material world. This is not because of dry philosophical speculation. The devotees become disinterested in the material world, not simply because of theoretical understanding, but practical experience. When a devotee realizes the effect of association with the Supreme Lord, he naturally hates the association of so-called society, friendship and love. This detachment is not dry, but is due to achieving a higher status of life by relishing transcendental mellows. 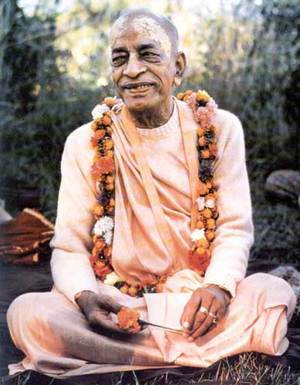 It is further stated in the Srimad-Bhagavatam that after attainment of such knowledge and detachment from material sense gratification, one's advancement in the eight opulences attained by mystic yoga practice, namely the anima, laghima and prapti siddhis, etc., are also achieved without separate effort. The perfect example is Maharaja Ambarisa. He was not a mystic yogi but he was a great devotee, yet in a disagreement with Maharaja Ambarisa, the great mystic Durvasa was defeated in the presence of his devotional attitude. In other words, a devotee does not need to practice the mystic yoga system to achieve power. The power is behind him by the grace of the Lord, just as when a small child is surrendered to a powerful father, all the powers of the father are behind him. When a person becomes famous as a devotee of the Lord, his reputation is never to be extinguished. Lord Caitanya, when discoursing with Ramananda Raya, questioned, "What is the greatest fame?" Ramananda Raya replied that to be known as a pure devotee of Lord Krsna is the perfect fame. The conclusion, therefore, is that Visnu-dharma, or the religion of devotional service unto the Supreme Personality of Godhead, is meant for persons who are thoughtful. By proper utilization of thoughtfulness, one comes to the stage of thinking of the Supreme Personality of Godhead. By thinking of the Supreme Personality of Godhead, one becomes free from the contamination of the faulty association of the material world, and thus one becomes peaceful. The world is in a disturbed condition because of a scarcity of such peaceful devotees in human society. Unless one is a devotee, one cannot be equal to all living entities. A devotee is equally disposed towards the animals, the human beings and all living entities because he sees every living entity as a part and parcel of the Supreme Lord. In the Isopanisad it is clearly stated that one who has come to the stage of seeing all living beings equally does not hate anyone or favor anyone. The devotee does not hanker to possess more than he requires. Devotees are therefore akincana; in any condition of life a devotee is satisfied. It is said that a devotee is evenminded whether he is in hell or in heaven. A devotee is callous to all subjects other than his engagement in devotional service. This mode of life is the highest perfectional stage, from which one can be elevated to the spiritual world, back home, back to Godhead. The devotees of the Supreme Personality of Godhead are especially attracted by the highest material quality, goodness, and the qualified brahmana is the symbolic representation of this goodness. Therefore, a devotee is attached to the brahminical stage of life. He is not very much interested in passion or ignorance, although these qualities also emanate from the Supreme Lord, Visnu. In the Srimad-Bhagavatam the devotees are described as nipuna-buddhayah, which means that they are the most intelligent class of men. Uninfluenced by attachment or hatred, the devotee lives very peacefully and is not agitated by the influence of passion and ignorance. It may be questioned here why a devotee should be attached to the quality of goodness in the material world if he is transcendental to all material qualities. The answer is that there are different kinds of people existing in the modes of material nature. Those who are in the mode of ignorance are called Raksasas, those in the mode of passion are called asuras, and those in the mode of goodness are called suras, or demigods. Under the direction of the Supreme Lord, these three classes of men are created by material nature, but those who are in the mode of goodness have a greater chance to be elevated to the spiritual world, back home, back to Godhead. Thus all the sages who assembled on the bank of the river Sarasvati to try to determine who is the supreme predominating deity became freed from all doubts about Visnu worship. All of them thereafter engaged in devotional service, and thus they achieved the desired result and went back to Godhead. Those who are actually anxious to be liberated from material entanglement would do better to accept at once the conclusion given by Sri Sukadeva Gosvami in the beginning of the Srimad-Bhagavatam. It is said there that hearing the Srimad-Bhagavatam is extremely conducive to liberation because it is spoken by Sukadeva Gosvami. The same fact is again confirmed by Suta Gosvami: if anyone who is traveling aimlessly within this material world cares to hear the nectarean words spoken by Sukadeva Gosvami, certainly he will come to the right conclusion; simply by discharging devotional service to the Supreme Personality of Godhead he will be able to stop the fatigue of migrating from one material body to another perpetually. In other words, by proper hearing one will become fixed in loving devotional service to Visnu. He will certainly be able to get relief from this material journey of life, and the process is very simple. One has to give aural reception to the sweet words spoken by Sukadeva Gosvami in the form of Srimad-Bhagavatam. Another conclusion is that we should never consider the demigods, even Lord Siva and Lord Brahma, to be on an equal level with Lord Visnu. If we do this, then according to Padma Purana, we immediately become atheists. In the Vedic literature known as Harivamsa it is also stated that only the Supreme Personality of Godhead, Visnu, is to be worshiped. The Hare Krsna mahamantra, or any such Visnu mantra, is always to be chanted. In the Second Canto of Srimad-Bhagavatam, Lord Brahma says, "Both Lord Siva and myself are engaged by the Supreme Personality of Godhead to act in different capacities under His direction." In the Caitanya-caritamrta it is also stated that the only master is Krsna, and everyone in all categories of life are servants of Krsna only. In the Bhagavad-gita it is confirmed by the Lord that there is no truth superior to Krsna. Sukadeva Gosvami also, in order to draw attention to the fact that among all visnu-tattva forms, Lord Krsna is one hundred percent the Supreme Personality of Godhead, narrated the story of an incident which took place when Lord Krsna was present. Once upon a time, a brahmana's wife gave birth to a child. Unfortunately, however, just after being born and touching the ground, the child immediately died. The brahmana father took the dead child and went directly to Dvaraka to the palace of the King. The brahmana was very upset because of the untimely death of the child in the presence of his young father and mother. Thus his mind became very disturbed. Formerly, when there were responsible kings, up to the time of Dvapara-yuga, when Lord Krsna was present, the king was liable to be blamed for the untimely death of a child in the presence of his parents. Similarly, such responsibility was there during the time of Lord Ramacandra. As we have explained in the First Canto of Srimad-Bhagavatam, the king was so responsible for the comforts of the citizens that he was to see that there was not even excessive heat or cold. Although there was no fault on the part of the King, the brahmana whose child had died immediately went to the palace door and began to accuse the King as follows. "The present King, Ugrasena, is envious of the brahmanas!" The exact word used in this connection is brahma-dvisah. One who is envious of the Vedas or one who is envious of a qualified brahmana or the brahmana caste is called brahma-dvit. So the King was accused of being brahma-dvit. He was also accused of being satha-dhi, falsely intelligent. The executive head of a state must be very intelligent to see to the comforts of the citizens, but, according to the brahmana the King was not at all intelligent, although he was occupying the royal throne. Therefore he also called him lubdha, which means greedy. In other words, a king or an executive head of state should not occupy the exalted post of presidency or kingship if he is greedy and self-interested. But it is natural that an executive head becomes self-interested when he is attached to material enjoyment. Therefore, another word used here is visayatmanah. The brahmana also accused the King of being ksatra-bandhu, which refers to a person born in the family of ksatriyas or the royal order who is without the qualifications of a royal personality. A king should protect brahminical culture and should be very alert to the welfare of his citizens; he should not be greedy due to attachment to material enjoyment. If a person with no qualifications represents himself as a ksatriya of the royal order, he is not called a ksatriya, but a ksatra-bandhu. Similarly, if a person is born of a brahmana father but has no brahminical qualification, he is called brahma-bandhu or dvija-bandhu. This means that a brahmana or a ksatriya is not accepted simply by birth. One has to qualify himself for the particular position; only then is he accepted as a brahmana or a ksatriya. Thus the brahmana accused the King that his newly born baby was dead due to the disqualifications of the King. The brahmana took it most unnaturally, and therefore he held the King to be responsible. We also find in Vedic history that if a ksatriya king was irresponsible, sometimes a consulting board of brahmanas maintained by the monarchy would dethrone him. Considering all these points, it appears that the post of monarch in the Vedic civilization is a very responsible one. The brahmana therefore said, "No one should offer respects or worship to a king whose only business is envy. Such a king spends his time either hunting and killing animals in the forest or killing citizens for criminal acts. He has no self-control and possesses bad character. If such a king is worshiped or honored by the citizens, the citizens will never be happy. They will always remain poor, full of anxieties and aggrievement, and always unhappy." Although in modern politics the post of monarch is abolished, the president is not held responsible for the comforts of the citizens. In this age of Kali, the executive head of a state somehow or other gets votes and is elected to an exalted post, but the condition of the citizens continues to be full of anxiety, distress, unhappiness, and dissatisfaction. The brahmana's second child was also born dead, and the third also. He had nine children, and each of them was born dead, and each time he came to the gate of the palace to accuse the King. When the brahmana came to accuse the King of Dvaraka for the ninth time, Arjuna happened to be present with Krsna. On hearing that a brahmana was accusing the King of not properly protecting him, Arjuna became inquisitive and approached the brahmana. He said, "My dear brahmana, why do you say that there are no proper ksatriyas to protect the citizens of your country? Is there not even someone who can pretend to be a ksatriya, who can carry a bow and arrow at least to make a show of protection? Do you think that all the royal personalities in this country simply engage in performing sacrifices with the brahmanas but have no chivalrous power?" Thus Arjuna indicated that ksatriyas should not sit back comfortably and engage only in performing Vedic rituals. Rather, they must be very chivalrous in protecting the citizens. Brahmanas, being engaged in spiritual activities, are not expected to do anything which requires physical endeavor. Therefore, they need to be protected by the ksatriyas so that they will not be disturbed in the execution of their higher occupational duties. "If the brahmanas feel unwanted separation from their wives and children," Arjuna continued, "and the ksatriya kings do not take care of them, then such ksatriyas are to be considered no more than stage players. In dramatic performances in the theater, an actor may play the part of a king, but no one expects any benefits from such a make-believe king. Similarly, if the king or the executive head of a state cannot give protection to the head of the social structure, he is considered merely a bluffer. Such executive heads simply live for their own livelihood while occupying exalted posts as chiefs of state. My lord, I promise that I shall give protection to your children, and if I am unable to do so, then I shall enter into blazing fire so that the sinful contamination which has infected me will be counteracted." Upon hearing Arjuna speak in this way, the brahmana replied, "My dear Arjuna, Lord Balarama is present, but He could not give protection to my children. Lord Krsna is also present, but He also could not give them protection. There are also many other heroes, such as Pradyumna and Aniruddha, carrying bows and arrows, but they could not protect my children." The brahmana directly hinted that Arjuna could not do that which was impossible for the Supreme Personality of Godhead. He felt that Arjuna was promising something beyond his power. The brahmana said, "I consider your promise to be like that of an inexperienced child. I cannot put my faith in your promise." Arjuna then understood that the brahmana had lost all faith in the ksatriya kings. Therefore, to encourage him, Arjuna spoke as if criticizing even his friend, Lord Krsna. While Lord Krsna and others were listening, he specifically attacked Krsna by saying, "My dear brahmana, I am neither Sankarsana nor Krsna nor one of Krsna's sons like Pradyumna or Aniruddha. My name is Arjuna, and I carry the bow known as Gandiva. You cannot insult me because I have satisfied even Lord Siva by my prowess when we were both hunting in the forest. I had a fight with Lord Siva, who appeared before me as a hunter, and when I satisfied him by my prowess, he gave me the weapon known as pasupatastra. Do not doubt my chivalry. I shall bring back your sons even if I have to fight with death personified." When the brahmana was assured by Arjuna in such exalted words, he somehow or other was convinced, and thus he returned home. When the brahmana's wife was to give birth to another child, the brahmana began to chant, "My dear Arjuna please come now and save my child." After hearing him, Arjuna immediately prepared himself by touching sanctified water and uttering holy mantras to protect his bows and arrows from danger. He specifically took the arrow which was presented to him by Lord Siva, and while going out, he began to remember Lord Siva and his great favor. In this way, he appeared in front of the maternity home, equipped with his bow, known as Gandiva, and with various other weapons. It appears that Arjuna did not leave Dvaraka because he had to fulfill his promise to the brahmana. He was called at night when the brahmana's wife was to give birth to the child. While going to the maternity home to attend to the delivery case of the brahmana's wife, Arjuna remembered Lord Siva, and not his friend Krsna; he thought that since Krsna could not give protection to the brahmana, it was better to take shelter of Lord Siva. This is another instance of how a person takes shelter of the demigods. This is explained in the Bhagavad-gita: kamais tais tair hrta-jnanah: a person who loses his intelligence because of greediness and lust forgets the Supreme Personality of Godhead and takes shelter of the demigods. Of course, Arjuna was not an ordinary living entity, but because of his friendly dealings with Krsna, he thought that Krsna was unable to give protection to the brahmana and that he would do better to remember Lord Siva. Later on it was proved that Arjuna's taking shelter of Lord Siva instead of Krsna was not at all successful. Arjuna, however, did his best by chanting different mantras, and he took up his bow to guard the maternity home from all directions. The brahmana's wife delivered a male child, and as usual the child began to cry. But suddenly, within a few minutes, both the child and Arjuna's arrows disappeared in the sky. It appeared that the brahmana's house was near Krsna's residence and that Lord Krsna was enjoying everything that was taking place apparently in defiance of His authority. It was He who played the trick of taking away the brahmana's baby as well as the arrows, including the one given by Lord Siva, of which Arjuna was so proud. Tad bhavaty alpa-medhasam: less intelligent men take shelter of the demigods due to bewilderment and are satisfied with the benefits they award. In the presence of Lord Krsna and others, the brahmana began to accuse Arjuna: "Everyone see my foolishness! I put my faith in the words of Arjuna, who is impotent and who is expert only in false promises. How foolish I was to believe Arjuna. He promised to protect my child when even Pradyumna, Aniruddha, Lord Balarama and Lord Krsna failed. If such great personalities could not protect my child, then who can do so? I therefore condemn Arjuna for his false promise, and I also condemn his celebrated bow Gandiva and his impudency in declaring himself greater than Lord Balarama, Lord Krsna, Pradyumna and Aniruddha. No one can save my child, for he has already been transferred to another planet. Due to sheer foolishness only, Arjuna thought that he could bring back my child from another planet." Thus condemned by the brahmana, Arjuna empowered himself with a mystic yoga perfection so that he could travel to any planet to find the brahmana's baby. It seems that Arjuna had mastered the mystic yogic power by which yogis can travel to any planet they desire. He first of all went to the planet known as Yamaloka, where the superintendent of death, Yamaraja, lives. There he searched for the brahmana's baby, but he was unable to find him. He then immediately went to the planet where the King of heaven, Indra, lives. When he was unable to find the baby there, he went to the planets of the fire demigods, Nairrti, and then to the moon planet. Then he went to Vayu and to Varunaloka. When he was unable to find the baby in those planets, he went down to the Rasatala planet, the lowest of the planetary systems. After traveling to all these different planets, he finally went to Brahmaloka, where even the mystic yogis cannot go. By the grace of Lord Krsna, Arjuna had that power, and he went above the heavenly planets to Brahmaloka. When he was unable to find the baby even after searching all possible planets, he then attempted to throw himself into a fire, as he had promised the brahmana if unable to bring back his baby. Lord Krsna, however, was very kind toward Arjuna because Arjuna happened to be the most intimate friend of the Lord. Lord Krsna persuaded Arjuna not to enter the fire in disgrace. Krsna indicated that since Arjuna was His friend, if he were to enter the fire in hopelessness, indirectly it would be a blemish on Him. Lord Krsna therefore checked Arjuna, assuring him that He would find the baby. He told Arjuna, "Do not foolishly commit suicide." After addressing Arjuna in this way, Lord Krsna called for His transcendental chariot. He mounted it along with Arjuna and began to proceed north. Lord Krsna, the all-powerful Personality of Godhead, could have brought the child back without effort, but we should always remember that He was playing the part of a human being. As a human being has to endeavor to achieve certain results, so Lord Krsna, like an ordinary human being, or like His friend Arjuna, left Dvaraka to bring back the brahmana's baby. By appearing in human society and exhibiting His pastimes as a human being, Krsna definitely showed that there was not a single personality greater than He. "God is great." That is the definition of the Supreme Personality of Godhead. So at least within this material world, while He was present, Krsna proved that there was no greater personality within the universe. Seated on His chariot with Arjuna, Krsna began to proceed north, crossing over many planetary systems. These are described in the Srimad-Bhagavatam as sapta-dvipa. Dvipa means island. All these planets, are sometimes described in the Vedic literature as dvipas. The planet on which we are living is called Jambudvipa. Outer space is taken as a great ocean of air, and within that great ocean of air there are many islands, which are the different planets. In each and every planet there are oceans also. In some of the planets, the oceans are of salt water, and in some of them there are oceans of milk. In others there are oceans of liquor, and in others there are oceans of ghee or oil. There are different kinds of mountains also. Each and every planet has a different type of atmosphere. Krsna passed over all these planets and reached the covering of the universe. This covering is described in the Srimad-Bhagavatam as great darkness. This material world as a whole is described as dark. In the open space there is sunlight, and therefore it is illuminated, but in the covering, because of the absence of sunlight, it is naturally dark. When Krsna approached the covering layer of this universe, the four horses which were drawing His chariot--Saibya, Sugriva, Meghapuspa and Balahaka--all appeared to hesitate to enter the darkness. This hesitation is also a part of the pastimes of Lord Krsna because the horses of Krsna are not ordinary. It is not possible for ordinary horses to go all over the universe and then enter into its outer covering layers. As Krsna is transcendental, similarly His chariot and His horses and everything about Him are also transcendental, beyond the qualities of this material world. We should always remember that Krsna was playing the part of an ordinary human being, and His horses also, by the will of Krsna, played the parts of ordinary horses in hesitating to enter the darkness. Krsna is known as Yogesvara, as is stated in the last portion of Bhagavad-gita. Yogesvaro harih: all mystic powers are under His control. In our experience, we can see many human beings who have yogic mystic power. Sometimes they perform very wonderful acts, but Krsna is understood to be the master of all mystic power. Therefore, when He saw that His horses were hesitant to proceed into the darkness, He immediately released His disc, known as the Sudarsana cakra, which illuminated the sky a thousand times brighter than sunlight. The darkness of the covering of the universe is also a creation of Krsna's, and the Sudarsana cakra is Krsna's constant companion. Thus the darkness was penetrated by His keeping the Sudarsana cakra in front. The Srimad-Bhagavatam states that the Sudarsana cakra penetrated the darkness just as an arrow released from the Sarnga bow of Lord Ramacandra penetrated the army of Ravana. Su means very nice, and darsana means observation; by the grace of Lord Krsna's disc, Sudarsana, everything can be seen very nicely, and nothing can remain in darkness. Thus Lord Krsna and Arjuna crossed over the great region of darkness covering the material universes. Arjuna then saw the effulgence of light known as the brahmajyoti. The brahmajyoti is situated outside the covering of the material universes, and because it cannot be seen with our present eyes, this brahmajyoti is sometimes called avyakta. This spiritual effulgence is the ultimate destination of the impersonalists known as Vedantists. The brahmajyoti is also described as anantaparam, unlimited and unfathomed. When Lord Krsna and Arjuna reached this region of the brahmajyoti, Arjuna could not tolerate the glaring effulgence, and he closed his eyes. Lord Krsna's and Arjuna's reaching the brahmajyoti region is described in Harivamsa. In that portion of the Vedic literature, Krsna informed Arjuna, "My dear Arjuna, the glaring effulgence, the transcendental light which you are seeing, is My bodily rays. O chief of the descendants of Bharata, this brahmajyoti is Myself." As the sun disc and the sunshine cannot be separated, similarly Krsna and His bodily rays, the brahmajyoti, cannot be separated. Thus Krsna claimed that the brahmajyoti is He Himself. This is clearly stated in the Harivamsa, when Krsna says, "aham sah." The brahmajyoti is a combination of the minute particles known as spiritual sparks, or the living entities known as citkana. The Vedic word so'ham, or "I am the brahmajyoti," can also be applied to the living entities, who can also claim to belong to the brahmajyoti. In the Harivamsa, Krsna further explains, "This brahmajyoti is an expansion of My spiritual energy." Krsna told Arjuna, "The brahmajyoti is beyond the region of My external energy, known as maya-sakti." When one is situated within this material world, it is not possible for him to experience this Brahman effulgence. Therefore, in the material world this effulgence is not manifested, whereas in the spiritual world, it is manifested. That is the purport of the words vyakta-avyakta. In the Bhagavad-gita it is said avyakto 'vyaktat sanatanah: both these energies are eternally manifested. After this, Lord Krsna and Arjuna entered a vast extensive spiritual water. This spiritual water is called the Karanarnava Ocean or Viraja which means that this ocean is the origin of the creation of the material world. In the Mrtyunjaya Tantra, a Vedic literature, there is a vivid description of this Karana Ocean, or Viraja. It is stated there that the highest planetary system within the material world is Satyaloka, or Brahmaloka. Beyond that there are Rudraloka and Maha-Visnuloka. Regarding this Maha-Visnuloka, it is stated in the Brahma-samhita, yah karanarnava-jale bhajati sma yoga: "Lord Maha-Visnu is lying in the Karana Ocean. When He exhales, innumerable universes come into existence, and when He inhales, innumerable universes enter within Him." In this way, the material creation is generated and again withdrawn. When Lord Krsna and Arjuna entered the water, it appeared that there was a strong hurricane of transcendental effulgence brewing, and the water of the Karana Ocean was greatly agitated. By the grace of Lord Krsna, Arjuna had the unique experience of being able to see the very beautiful Karana Ocean. Accompanied by Krsna, Arjuna saw a large palace within the water. There were many thousands of pillars and columns made of valuable jewels, and the glaring effulgence of those columns was so beautiful that Arjuna became charmed by it. Within that palace, Arjuna and Krsna saw the gigantic form of Anantadeva, who is also known as Sesa. Lord Anantadeva or Sesa Naga was in the form of a great serpent with thousands of hoods, and each one of them was decorated with valuable, effulgent jewels, which were beautifully dazzling. Each of Anantadeva's hoods had two eyes which appeared very fearful. His body was as white as the mountaintop of Kailasa, which is always covered by snow. His neck was bluish, as were His tongues. Thus Arjuna saw the Sesa Naga form, and he also saw that on the very soft, white body of Sesa Naga, Lord Maha-Visnu was lying very comfortably. He appeared to be all-pervading and very powerful, and Arjuna could understand that the Supreme Personality of Godhead in that form is known as Purusottama. He is known as Purusottama, the best, or the Supreme Personality of Godhead, because from this form emanates another form of Visnu, which is known as Garbhodakasayi Visnu within the material world. The Maha-Visnu form of the Lord, Purusottama, is beyond the material world. He is also known as Uttama. Tama means darkness, and ut means above, transcendental; therefore, Uttama means above the darkest region of the material world. Arjuna saw that the bodily color of Purusottama, Maha-Visnu, was as dark as a new cloud in the rainy season; He was dressed in very nice yellow clothing, His face was always beautifully smiling, and His eyes, which were like lotus petals, were very attractive. Lord Maha-Visnu's helmet was bedecked with valuable jewels, and His beautiful earrings enhanced the beauty of the curling hair on His head. Lord Maha-Visnu had eight arms, all very long, reaching to His knees. His neck was decorated with the Kaustubha jewel, and His chest was marked with the symbol of Srivatsa, which means the resting place of the goddess of fortune. The Lord wore a garland of lotus flowers down to His knees. This long garland is known as a Vaijayanti garland. The Lord was surrounded by His personal associates Nanda and Sunanda, and the personified Sudarsana disc was also standing by Him. As is stated in the Vedas, the Lord has innumerable energies, and they were also standing there personified. The most important among them were as follows: Pusti, the energy for nourishment, Sri, the energy of beauty, Kirti, the energy of reputation, and Aja, the energy of material creation. All these energies are invested in the administrators of the material world, namely Lord Brahma, Lord Siva and Lord Visnu, and in the kings of the heavenly planets, Indra, Candra, Varuna and the sun-god. In other words, all these demigods, being empowered by the Lord with certain energies, engage in the transcendental loving service of the Supreme Personality of Godhead. The Maha-Visnu feature is an expansion of Krsna's body. It is also confirmed in the Brahma-samhita that Maha-Visnu is a portion of a plenary expansion of Krsna. All such expansions are nondifferent from the Personality of Godhead, but since Krsna appeared within this material world to manifest His pastimes as a human being, He and Arjuna immediately offered their respects to Lord Maha-Visnu by bowing down before Him. It is stated in the Srimad-Bhagavatam that Lord Krsna offered respect to Maha-Visnu; this means that He offered obeisances unto Him only because Lord Maha-Visnu is nondifferent from He Himself. This offering of obeisances by Krsna to Maha-Visnu is not, however, the form of worship known as ahangraha-upasana, which is sometimes recommended for persons who are trying to elevate themselves to the spiritual world by performing the sacrifice of knowledge. This is also stated in the Bhagavad-gita: jnana-yajnena capy anye yajanto mam upasate. Although there was no necessity for Krsna to offer obeisances, because He is the master teacher, He taught Arjuna just how respect should be offered to Lord Maha-Visnu. Arjuna, however, became very much afraid upon seeing the gigantic form of everything, distinct from the material experience. Seeing Krsna offering obeisances to Lord Maha-Visnu, he immediately followed Him and stood before the Lord with folded hands. After this, the gigantic form of Maha-Visnu, greatly pleased, smiled pleasingly and spoke as follows. "My dear Krsna and Arjuna, I was very anxious to see you both, and therefore I arranged to take away the babies of the brahmana and keep them here. I have been expecting to see you both at this palace. You have appeared in the material world as My incarnations in order to minimize the force of the demoniac persons who burden the world. Now after killing all these unwanted demons, you will please again come back to Me. Both of you are incarnations of the great sage Nara-Narayana. Although you are both complete in yourselves, to protect the devotees and to annihilate the demons and especially to establish religious principles in the world so that peace and tranquillity may continue, you are teaching the basic principles of factual religion so that the people of the world may follow you and thereby be peaceful and prosperous." Both Lord Krsna and Arjuna then offered their obeisances to Lord Maha-Visnu, and taking back the brahmana's children, they returned to Dvaraka via the same route by which they had entered the spiritual world. All the children of the brahmana had duly grown up. After returning to Dvaraka, Lord Krsna and Arjuna delivered to the brahmana all of his sons. Arjuna, however, was struck with great wonder after visiting the transcendental world by the grace of Lord Krsna. And by the grace of Krsna he could understand that whatever opulence there may be within this material world is an emanation from Him. Any opulent position a person may have within this material world is due to Krsna's mercy. One should therefore always be in Krsna consciousness, in complete gratefulness to Lord Krsna, because whatever one may possess is all His mercy. Arjuna's wonderful experience due to the mercy of Krsna is one of the many thousands of pastimes performed by Lord Krsna during His stay in this material world. They were all unique and have no parallel in the history of the world. All these pastimes prove fully that Krsna is the Supreme Personality of Godhead, yet while He was present within this material world, He played just like an ordinary man possessing many worldly duties. He played the part of an ideal householder, and although He possessed 16,000 wives, 16,000 palaces and 160,000 children, He also performed many sacrifices, just to teach the royal order how to live in the material world for the welfare of humanity. As the ideal Supreme Personality, He fulfilled the desires of everyone, from the brahmanas, the highest persons in human society, down to the ordinary living entities, including the lowest of men. Just as King Indra is in charge of distributing rain all over the world to satisfy everyone in due course, so Lord Krsna satisfies everyone by pouring down His causeless mercy. His mission was to give protection to the devotees and to kill the demoniac kings; therefore, He killed many hundreds and thousands of demons. Some of them He killed personally, and some of them were killed by Arjuna, who was deputed by Krsna. In this way He established many pious kings such as Yudhisthira at the helm of world affairs. Thus, by His divine arrangement He created the good government of King Yudhisthira, and there ensued peace and tranquillity. Thus ends the Bhaktivedanta purport of the Eighty-ninth Chapter of Krsna, "The Superexcellent Power of Krsna."